Sleep: You guys... I really need some advice on this! It was better but now it's probably the worst it's been. For some reason my back decided to start killing me in the middle of the night. I just can't get comfortable. (I've also been forgetting to drink my peppermint tea!) I have to prop myself up on pillows for the heartburn but still sleep on my side b/c I can't sleep on my back. But then sleeping on my side at an angle kinks my back in a weird position. I just can't win. Let's just say I'm definitely prepared to stay up all night with a newborn now! Movement: Maggie's actually been moving quite a bit this week. I even think I finally felt her hiccup for the first time! This past weekend we were visiting Ryan's family and all of us were down stairs in the basement playing either ping pong or pool. Well, Ryan's brother-in-law, Sean, dropped one of the pool balls on the table and it made this really loud cracking sound, and Maggie jumped so hard in my stomach! Poor thing, it was the first time that I could feel her get startled from a lound sudden noise. It totally cracked me up though to feel that! Best moment this week: There were lots of fun things! Maggie's rocker was finally delivered and we LOVE it! (Pictures to come soon.) We also had some of our new bedroom furniture deliveried too. They messed up one of the side tables and the headboard isn't coming until mid March. So I'll post pictures of it when everything is in. We decided if we were ever going to get our own bedroom furniture we better do it before Maggie got here or it would never happen. We had Friday off so Ryan & I were able to get a lot of things done that day including taking KC (our cat) in for a follow up on his leg. We are now starting to let him walk around outside his cage while we are home. So nerve wrecking though! He goes back in another month for a follow up x-ray & that will determine if he needs more surgery. We also traveled to Ryan's home town to celebrate Emily, Harlan and Papa's birthdays AND delivered the bedroom furniture we were borrowing. It was a crazy weekend but oh so much fun! It's probably the last time we will be there without Maggie!!! Looking forward to: Not too much going on this week which is something to look forward to for me. Ha! Our good friends, Nate & Janet's, son Jaxon is turning one and we are going to his birthday party on Sunday, but other then that nothing else is really planned. So I'm hoping we are able to tackle a few more nursery projects this weekend! I did want to show you all what we picked out for Maggie's "going home" outfit from the hospital. :) I think it's so cute!! It will fit a newborn and the sleeves can roll over her hands so that she won't scratch herself but then will roll back out so she has more room to grow in it. Sorry this is blurry. I snapped this picture really quick with my camera phone. A little closer up. We got it off Etsy (where else) at this shop here. OMG that going home outfit is to die for!!! SO stinkin' cute! You might ask your doctor if you can sleep on your back if you are propped up with pillows. That's how I slept towards the end of my pregnancy with Chloe and I didn't think there was anything wrong with it, but you might double check to be sure. Isn't it crazy how little sleep you get before the baby is even here?! Love her going home outfit! Love monogramming on little girls. Yeah, you can pretty much forget the sleep from now on until sweet little miss decides to sleep through the night. Good luck!!! Love the outfit!! I wish I had some kind of brilliant advice for sleeping, but I felt the same way until P-Man made an appearance. Saying some prayers that you can get some much-needed rest before she arrives! Sorry about the sleeping situation :( love the going home outfit! Probably one of the cutest I've seen. 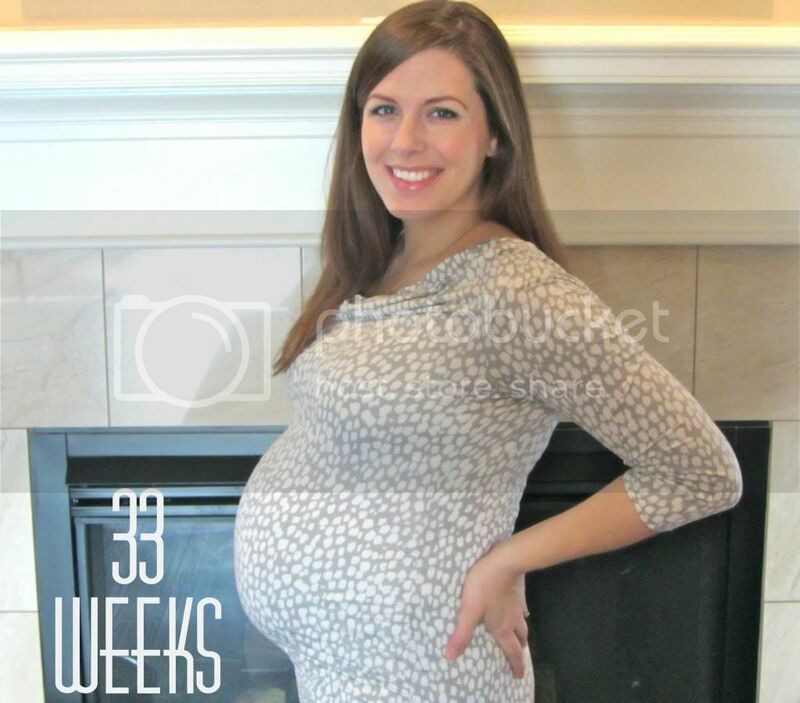 Is your dress/top maternity? If so, where from? It looks great on you!